This image shows pairs of Anolis species from different Greater Antillean islands that have independently evolved matching morphologies. Anoles diversifying on four islands repeatedly colonized the same adaptive peaks on a shared evolutionary landscape, resulting not just in convergence among a few species pairs, such as those shown here, but in the convergence of entire island anole faunas. From left to right, the top row depicts giant tree crown specialists Anolis cuvieri (Puerto Rico; photo by J. Losos) and A. garmani (Jamaica); second row depicts the twig specialists A. garridoi (Cuba) and A. occultus (Puerto Rico); third row depicts trunk and ground specialists A. cybotes (Hispaniola; photo by B. Falk) and A. lineatopus (Jamaica); fourth row depicts grass specialists A. alumina (Hispaniola; photo by M. Landestoy) and A. alutaceus (Cuba). Credit: Luke Mahler, UC Davis. If you could hit the reset button on evolution and start over, would essentially the same species appear? Yes, according to a study of Caribbean lizards by researchers at the University of California, Davis, Harvard University and the University of Massachusetts. The work is published July 19 in the journal Science. The predictability of evolution over timescales of millions of years has long been debated by biologists, said Luke Mahler, a postdoctoral fellow at UC Davis and first author on the paper. For example, the late Stephen Jay Gould predicted that if you "rewound the tape" on evolution and started over, you would get an entirely different outcome, arguing that small events—a storm that wiped out a particular pond, a poor season for insects—could have a disproportionate effect. On the other hand, there are a number of examples of species in similar habitats that evolve independently into similar-looking forms, such as the cichlid fishes of African lakes. "It's a big question in evolutionary biology, but very hard to test," Mahler said. Mahler found his test subjects in the Anole lizards that live on four neighboring islands—Cuba, Hispaniola (the countries of Haiti and the Dominican Republic), Jamaica and Puerto Rico. Anoles began colonizing these islands, all similar in climate and ecology, about 40 million years ago, and once there, they began to multiply, resulting in a diversity of species on each. 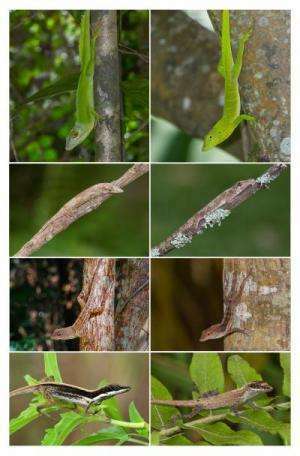 The researchers studied 100 of the 119 Anole lizard species from the islands, taking measurements of their bodies from wild and museum specimens and comparing them across islands. They found a striking degree of convergence—on each island, evolution had produced a set of very similar-looking lizards occupying similar environmental niches. "The adaptive radiations match on all four islands – with few exceptions, each species on an island has a match on the other islands," Mahler said. By combining the body-form data with a family tree of the Anoles, Mahler and colleagues were able to construct an "adaptive landscape" for the lizards. An adaptive landscape is a fundamental concept in evolutionary biology but difficult to show in practice. Peaks on an adaptive landscape represent various combinations of features that will be favored by natural selection, whereas valleys are just the opposite. Species with similar habits will tend to cluster on the same peak. For Anole lizards, their niche might be living on tree-trunks, or among twigs high in a tree, or down in the grasses on the ground. Each calls for different adaptations, and creates a different adaptive peak. The adaptive landscapes of all four islands are very similar, the researchers found. Looking back at the lizards' evolutionary history, they were able to determine when a particular peak was colonized, or when a species hopped from one peak to another. The landscape drives convergence, they discovered. "The cool part is that we now have a way of modeling the adaptive landscape that explains this convergence," Mahler said. Perhaps, but finches in the different Galapagos islands diverged from a common stock.